How can I include a custom CSS file on a product detail page for a specific product type (e.g. grouped, downloadable, configurable, etc.)? Where “css/custom_example.css” is the file path in our custom theme. Of course, make sure you have put the custom file on the specified path. In this case, it means the folder with css files of our custom theme: “/skin/frontend/our_package/our_theme/css”. Don’t forget to clear cache after making changes. How can I include a custom CSS file on a CMS page? In order to include the custom file (for example, “custom_example.css”) for CMS Page, there’re two possible ways. But before applying, it’s necessary to put the custom file in the folder with CSS files of our custom theme: “/skin/frontend/our_package/our_theme/css”. Where “css/custom_example.css” is the file path in our custom theme. 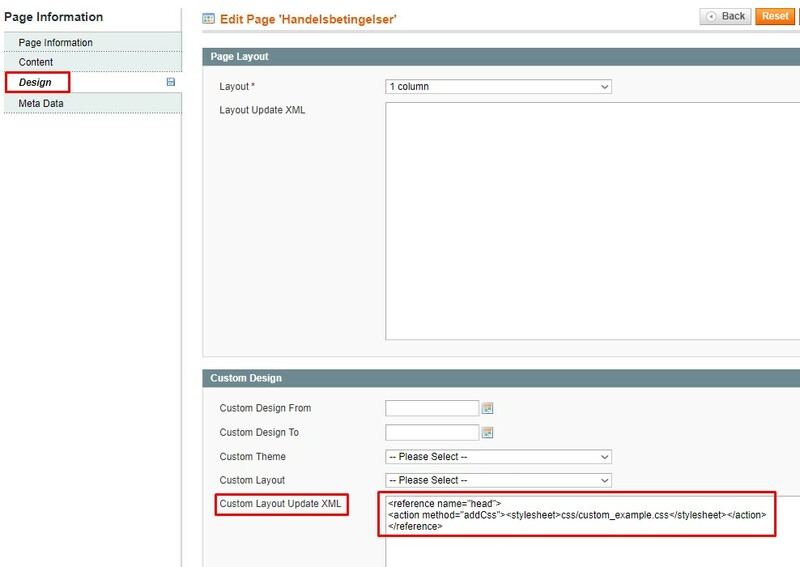 Where the meaning of the attribute “page_id” is the id of the CMS Page which the custom styles file is going to be applied for; “css/custom_example.css” is the file path in our custom theme. Don’t forget to clear cache after making changes. I would add for myself, it’s not useful to practice the second way, as it “litters” the layout file and, as a result, you have to monitor when deleting CMS Page, there’s no unused connection code of custom files left. How can you avoid copying core layout XML files into a custom theme by using the local.xml layout file? We can avoid copying core layout XML files into a custom theme by using different handles, directives, and methods in the layout file local.xml. Let’s analyze details! Specify the necessary handle (for example, <default> or <page_empty>, so it depends on the pages it will be applied for). Define the necessary directive (for example, <reference name=”root”> in order to refer to the highest block of the structure). Practise necessary methods (for example, the method “remove” should be used for removing the block from the current position). If you need to learn more information related to directives, handles, and methods, read the article. It was the general algorithm, but let’s consider some real examples of standard tasks, which we can cope with in the file local.xml. <cms_index_index> – handle, which shows that changes contained will refer to the home page only. <reference name=”head”> – directive, which points out that changes will concern the block “head” on the page. <action method=”addCss”> – method of adding styles files (“css/custom_styles.css” – styles file path). <action method=”addJs”> – method of adding scripts files (“js/custom_scripts.js” – scripts file path). <catalog_category_default> – handle, which shows that changes contained will refer to the category page only. <reference name=”root”> – directive, which points out that changes will concern the highest block. <action method=”setTemplate”> – method of using the necessary template. “page/2columns-right.phtml” – path to the template used.